unless something changed, it's 8 tournament qualifiers. So Hoi is holding onto the last spot and Maslow is still alive because he would win the tie breaker (H2H) over Hoi. Really? Davies told me four qualifiers. Then the 2 winners go into semi finals vs top 2 which will be drawn at random. I think thats the best way to conclude the season. Wow, What a fight between Carlton and Hoi. Carlton came so close. Maslow wins again too haha comeback kid. And Curry smashes Tyson , baaaaaammm!! hoi is only dangerous when hurt. normal hoi is very pillowfisted for a HW. Great tournament everyone. Thank you for letting Edward take part. 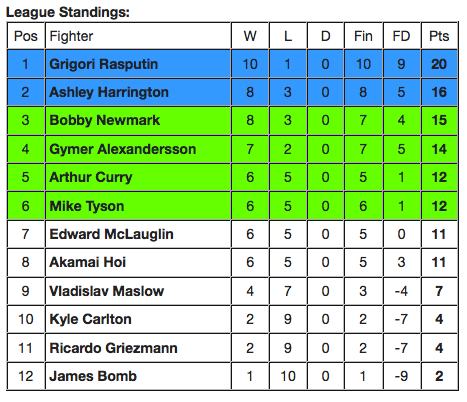 I'm sad he didn't make it into the championship bouts, but Ed's chin just couldn't hold up against the bigger heavy hitters like Rasputin, Harrington and Alexandersson. So he wouldn't have gone far anyway. Had he been a true heavyweight from the start maybe he could have made it a bit further, but maybe not. But I still want a Newmark rematch Bear. So before you put him out to pasture when his run here is done, you come see me. And congratulations to Bobby Newmark + Gymer Alexandersson for making it through to the semis! I'll sort out the semi-final draw with JLP when he comes online later today, fight offers won't be sent out until later this week (Harrington is making an appearance at EFFA this weekend) but you'll know in advance who you're up against.